When a government’s social policy resembles that of a dystopian novel, you know you’ve found a gritty slice of life worthy of attention. 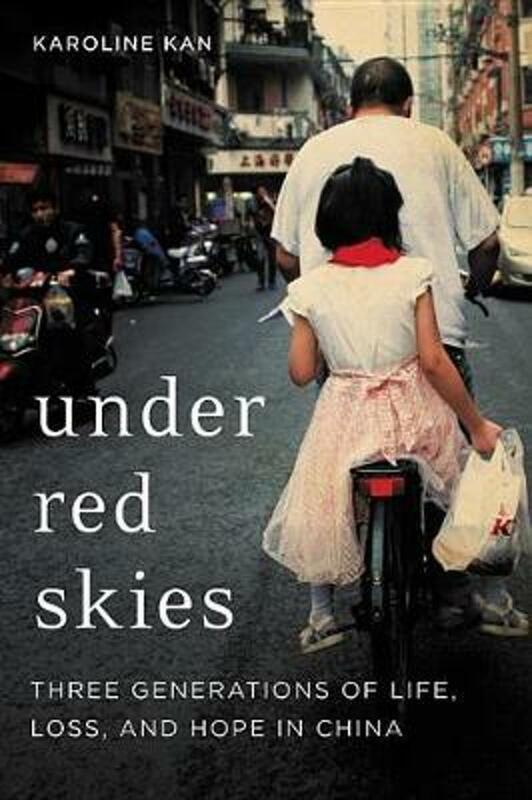 In Under Red Skies, second child Karoline Kan recounts her late-1980s origin story during China’s one child policy. Her life narrative comprises an informative gut check about the country’s current cultural zeitgeist, navigating the reality of mandatory abortions, forced sterilizations, and the blacklisted squalor of “unregistered” people. In terms of an overall chronicle, the book’s subtitle Three Generations of Life, Loss, and Hope in China may as well have been This Book Has No Theme. While extensively instructional and sociologically relevant, as an overall memoir it contains plenty to learn but not a lot to admire. Kan’s intermittent clumsy writing choices and inflated self-importance hinder her attempt at a memorable personal manifesto. Kan’s accessible presentation of modern China’s history and cultural identity is Under Red Skies’ standout selling point. She delivers a cogent account of government policy and social mores in all their necessary jarring details. The aforementioned one child policy, which was rolled back only as recently as 2015, is afforded extensive treatment in the story of Kan’s life. Imagine if your wife or daughter were coerced into periodic ultrasound appointments to verify the continued placement of an intrauterine contraceptive ring. Then imagine Kan’s mother hiding a strategically-placed iron ring in her coat pocket, thereby conning the physician into thinking the IUD was in fact there! Stark anecdotes like these represent the stronger points of the story. Also examined are the SARS epidemic, the government’s crackdown on religion and political free speech, the continued transactional nature of marriage, and the bizarre compulsory military training issued at the university level for students of all majors. This standout content is hindered by more than a few moments of clunky writing, which are as endearing as they are unfortunate. Kan is a former reporter for the New York Times, but no amount of social proof can explain away elementary blunders such as opening a paragraph with a three-item list, then elaborating only upon the second. Ending a paragraph with the plural possessive neighbors’ is another example of a narrative note landing more than a bit flat. In reference to her collegiate regimen she states “our schedule was bananas,” and describes her high school math teacher’s scoldings as delivered “in the meanest way you could imagine.” Upon meeting her first boyfriend she remarks that “through his glasses I noticed passion in his eyes.” During Obama’s first presidential run, she found him to be handsome and was “intrigued by his African American heritage,” as if the simple fact of his blackness was something novel to be gawked over. Coursing through multiple generations of the Kan family is a quiet undercurrent of entitlement that begins with her mother’s decision to defy the one child policy. Whether or not limitless human reproduction is an unalienable right is a separate discussion. But given the reality of China’s laws, Kan’s mother placed an extraordinary burden on her family members without their consent—a decision rooted solely on the premise that her existing male heir wasn’t enough; she instead deserved female offspring. Violation of the one child policy carries a hefty 6,000 yuan fine, a fee her mother full well knew she could never pay on her own. To assist, Karoline’s grandfather contributed his 2,000 yuan life savings, itself the product of several years’ income. The sum of their fundraising efforts just barely met the deadline, and was possible only by falsifying paperwork to deceitfully document her birthday, thereby extending the fine’s due date. Had that fine not been met on time, Karoline would have been blacklisted, officially barring her from attending school, obtaining healthcare, or even getting married. Her mother’s premeditated choice to create a new human being and subject it to such risky stakes isn’t brave—it’s reckless and irresponsible. It shouldn’t be applauded, for the same reason one would not commend a drunk driver that arrives home safely. Karoline’s own entitlement emerges during the outset of adulthood. Her first major love is a fellow college student named Wei, but she lacks the courage to make any kind of move, settling instead for the clean safety of platonic friendship. When Wei does eventually find a girlfriend, this is the collapse of Karoline’s entire world. To be sure, it’s totally understandable that a twenty-year-old might be subject to emotional catastrophe and heartbreak. Yet in writing about this event ten years later, our author has gained no additional insight, nor has she taken any percentage of responsibility for the disappointment. She has yet to learn that minimal courage yields minimal rewards, and maybe, just maybe, Wei just wasn’t that into her. Karoline’s given name, Chaoquin, means “to stand out from the crowd” which she deems appropriate since “survival and difference would be the running themes in my life.” This choice to trumpet the significance of survival—the obscure, underappreciated art of Not Dying—ties back to the themelessness of the book. And by the story’s end, her allegedly trailblazing behavior never emerges. The arc of her life so far: She leaves her small village to attend college in the city, studies finance, pursues journalism, and dates white foreigners. There isn’t much bravery or individuality in evidence, so by extension, the author’s attempts at self-congratulation are a collective air ball. Under Red Skies is the portrait of a nation she is amply qualified to deliver, but this is a double-edged sword. As she concedes, her life resembles her country, both of which “had become like a never-ending express train.” In pursuit of abstract status goals she’s unable to identify, she resigns herself to a furious persistent grind, drifting without roots, wholly subservient to an intangible cultural FOMO that she can’t shake off.